Review gas storage hot water systems. Know how they work- the pros and cons. Compare a storage hot water system to instantaneous / continuous flow systems. There are two distinct types of gas hot water systems for domestic and commercial hot water installations in Canberra. These are the gas storage systems and the gas continuous flow systems (also incorrectly known as instantaneous). 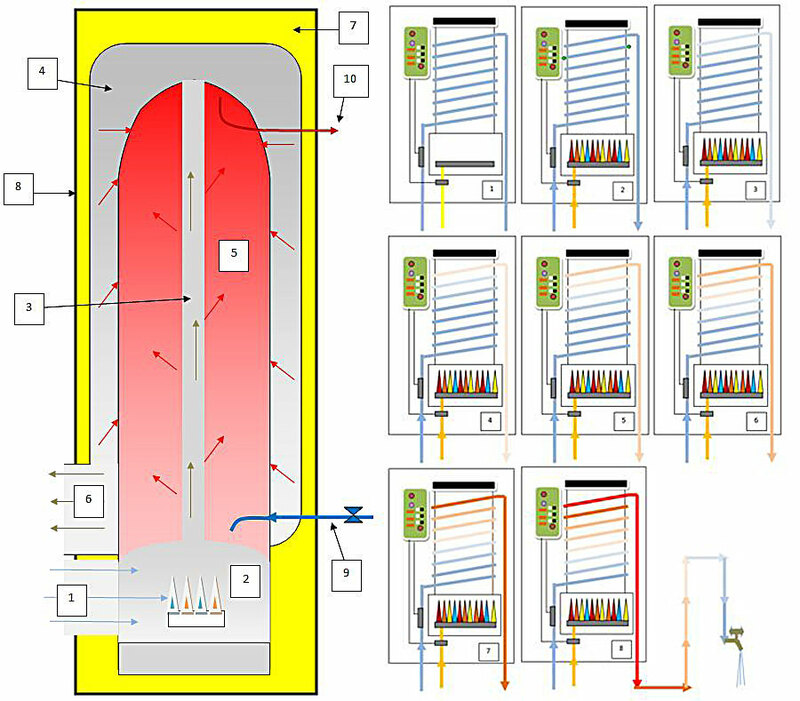 Below is an explanation of how a high efficiency gas hot water system works. You can learn about How continuous flow systems work. Air for combustion is drawn into the combustion chamber (2) of the hot water heater. Natural gas or LP gas is burnt in the combustion chamber. This creates super heated exhaust gases. The hot exhaust gases from the combustion chamber (2) rise up through a central flue (3). While in the central flue, some heat from the hot exhaust gases is transferred into the water in the hot water storage tank (5). Once the hot exhaust gases leave the central flue (3), the hot exhaust gases enter the exhaust shroud (4). The shroud envelops the hot water storage tank (5). More heat is transferred into the water in the hot water storage tank (5) from the hot gases in the exhaust shroud (4). Water in the hot water storage tank can stay hot for days without any heat input. This is because of the layer of insulation (7) between the outer casing (8) and the exhaust shroud (4). Cooler exhaust gases exit the flue terminal (6). These gases are mostly carbon dioxide and steam. Once the water is heated, the layer of foam insulation between the outer casing (8) and the exhaust shroud (4) will keep the hot water inside the hot water storage tank (5) hot for days without any further heat input. The continuous flow system has very little insulation and water inside goes cold very quickly. The outer casing is weather proof. It keeps moisture, dust and dirt out of the combustion chamber and exhaust shroud. It also protects the layer of foam insulation. Cold water entering through the cold water inlet pipe (9) forces hot water out of the hot water storage tank (5) through the hot water outlet (10) whenever a hot tap is turned on. Unlike continuous flow hot water systems, the water is always hot at the hot water outlet of the hot water storage tank. This makes them more water efficient than continuous flow gas hot water systems. In a high efficiency gas hot water system, up to 93% of the heat in the exhaust gases is transferred into the water inside the hot water storage tank. As a plumber I am often asked if I would choose a gas storage system or a continuous flow hot water system. These are the pros and cons of the gas storage system. Water efficient. Owners do not have to wait as long as they would for hot water when compared to gas continuous flow / instant hot water. Gas storage systems deliver 3x more hot water in the first hour than a similar sized electric hot water system. Domestic gas storage systems do not require electricity. They come in a huge variety of commercial hot water systems. They require a small gas line and use 80% less gas than a continuous flow system when they are on. Very quick recovery if you run out of hot water. Can be plumbed so 75°C water goes to kitchens and laundries and 50°C water goes to ablution areas as per AS/NZ 3500. You will have hot water during blackouts. Because of the cost of water in Canberra, the high efficiency gas storage systems are likely to be cheaper to run than continuous flow hot water systems. Cheaper to install than continuous flow and does not require an upgrade to 20mm gas pipe. They take up more space than continuous flow hot water systems. They do not provide an unlimited amount of hot water per hour. There are no internal high efficiency storage systems available for the domestic market. If you would like to know more, or get help with your storage gas hot water heater in Canberra or Queanbeyan you can contact us for help. We hope our review of gas storage hot water systems and the pros & cons helped you to properly compare them to instantaneous / continuous flow systems. 6 Star Hot Water & Plumbing Services Canberra your one stop, local plumbing specialists.